Katie is a very particular girl. She likes her vegetables prepared a particular way, chooses old movies she’s watched tens of times over new ones and has a favorite pair of pants that I’m fairly sure she’d wear every day if she could (the green Old Navy ones). When I first thought about buying her a ring, I had a few criteria. One, it couldn’t have a huge, protruding stone because, well, she’s accident prone and I didn’t want to contribute to that. Two, I didn’t want to buy the biggest, most expensive ring that my credit would allow, as I really, really didn’t want to enter into a marriage more in debt than I was before. 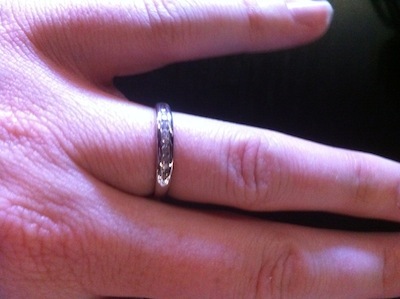 And I needed a ring that reflected her personality: understated, but really shiny when it wants to be. I looked at jewelry stores, pawn shops and even Craigslist in search of something that fit. Nothing seemed to. Everything either had a protruding stone or was far too loud for her, but after nearly six weeks of searching, I found the perfect ring. That is a beautiful ring. I love the reasoning behind it. Channel settings always do better for those who actually use their hands. You did good! Nice work, bro. That was pretty thoughtful of you. The ring is perfect! You and Katie are soul mates. I love the ring personally, it is the style I was looking at before Chris proposed to me. Yay! Congrats to you both! That is a beautiful ring, but even more, a beautiful sentiment. Love to you both! Very nice choice Ty, I love it! Did you get a matching wedding band, or are you going to wait until later? Ha! I have no idea about that part. Congrats to you both. This is the way it ought to be for all.